Lyoto Machida got back on track in front of a raucous hometown audience as the former champion slipped by Eryk Anders via split decision in a back and forth battle in Brazil. Following the toughest stretch of his career with three straight losses, Machida had something to prove as he stepped out into the main event on Saturday night while facing a young upstart in Anders, who asked for the opportunity to face a legend in his own backyard. Machida's best offense came from his counter strikes as he caught Anders coming in aggressively several times while also battering the former University of Alabama football standout's legs throughout the course of the fight. Anders certainly landed a lot of power shots over 25 minutes, but Machida ultimately outworked him by the narrowest of margins to earn the victory in the main event. While Machida had the experience edge, he still walked into the fight as the decided underdog with just 39 percent of fantasy players picking him to win. Machida showed there's still plenty of fight left in him as he was able to endure a five-round battle with one of the top up and coming talents in the middleweight division. 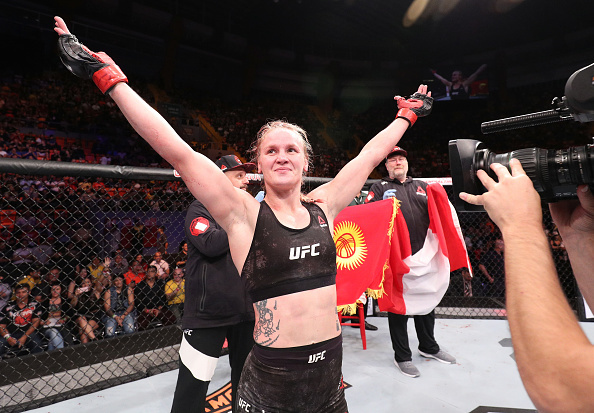 In the co-main event, Valentina Shevchenko lived up to her reputation as one of the best female fighters on the planet as she absolutely dismantled newcomer Priscila Cachoeira before finishing the fight in the second round by rear naked choke. Shevchenko was the biggest favorite on the entire card with a whopping 95 percent of fantasy players picking her to win as she kicks off her new career in the UFC women's flyweight division. Michel Prazeres got the job done in a hard-fought three-round battle against Desmond Green, with 67 percent of fantasy players picking him to get the win on Saturday night. Meanwhile, Tim Johnson pulled off the upset against previously undefeated heavyweight Marcelo Golm with just 39 percent of fantasy players selecting the American to get the job done in this matchup. Another upset took place, with Douglas Silva de Andrade getting the nod over Marlon Vera after 44 percent of fantasy players picked him to win. Thiago Santos picked up another huge TKO victory to kick off the main card as he dished out a devastating finish to Anthony Smith in a middleweight bout on Saturday night. Santos was one of the biggest favorites on the entire card, with 81 percent picking him to win and another 75 percent correctly predicting that he would get the victory by knockout. In the biggest upset of the night, Sergio Moraes edged out a razor-close split decision over Tim Means in the featured preliminary bout on the card. Moraes had to gut through a serious battle against Means with only 25 percent of fantasy players picking him to win, but he still got the job done after three rounds. Alan Patrick tacked another win on to his resume as he took out Damir Hadzovic in dominant fashion with a unanimous decision victory. Patrick was favored by 76 percent of fantasy players while also taking home an extra 120 points because the fight was a tight matchup on paper. Newcomer Polyana Viana made quite a showing in her debut, as she took out former Ultimate Fighter competitor Maia Stevenson with a first-round rear naked choke. It may have been her first UFC fight, but Viana was heavily favored, with 75 percent of fantasy players picking her to win while she also earned them an extra 40 points because it was her Octagon debut. Iuri Alcantara looked outstanding in his performance against Joe Soto in a bantamweight matchup on the preliminary card. Alcantara was a slight favorite, with 58 percent of fantasy players picking him to win, and he also earned an extra 120 points thanks to the fight with Soto being such a tight matchup going into the event. The night kicked off with promising prospect Deiveson Figueiredo picking up another impressive win as he took out Team Alpha Male fighter Joseph Morales by TKO. Figueiredo was a solid favorite going into the night, with 67 percent of fantasy players picking him to walk away victorious. When the night was finished, seven favorites came away victorious according to the picks made by fantasy players, while there were four upsets in total at UFC Fight Night: Machida vs. Anders.